The new venture from alums of Veritable Quandary tries to do too much, too often. Food isn't fashion, but the people behind Normandie should heed a lesson from the late designer Coco Chanel: "Before you leave the house, look in the mirror and take at least one thing off." The new venture from alums of the venerable, departed Veritable Quandary has spent the two months since it opened in early November working to establish a presence on a quiet corner a block removed from the hubbub of lower East Burnside Street. It faces multiple pitfalls—some beyond its control, others of its own making. But the biggest problem it suffers from is the disease of more, with a menu that tries to do too much, too often. The issues with Normandie, however, are clear even before sitting down. The restaurant moved into the space previously occupied by Rue, which flailed about for a year and a half before folding. It is a challenging location. The gray concrete building does nothing to attract a crowd. Nearby traffic—automobile, pedestrian and otherwise—tends to move along Burnside, where all the action is. Meanwhile, Ankeny Street, a mere block away, is a dark and ignorable backwater, and the angle of Sandy Boulevard to the south leaves Normandie isolated. The configuration of the L-shaped space itself is also off-putting. The corner entryway leads into the large-ish bar area. A divider portions the room into a proper bar and dining room of sorts, with a cushy, sea-blue banquette along the divider and a combination of high-top and standard tables. Portland-contemporary accents include both concrete and wooden floors, mismatched retro hanging lamps, rectangular white tiles, a high open ceiling and whimsical, seahorse-themed wallpaper. The back bar, topped by potted plants, is snazzy. The problem is that it feels more like a bar than a restaurant, in part because the open kitchen is relegated to the top of the long leg of the L, a veritable Siberia up a couple of stairs and far removed from the barroom action, save for two secluded tables and the restrooms. Those who enjoy a little kitchen theater are likely to be disappointed, though in fairness, I was told by one of the owners that this design anomaly was the result of a city accessibility demand. It is a bit harder to excuse the menu, though. 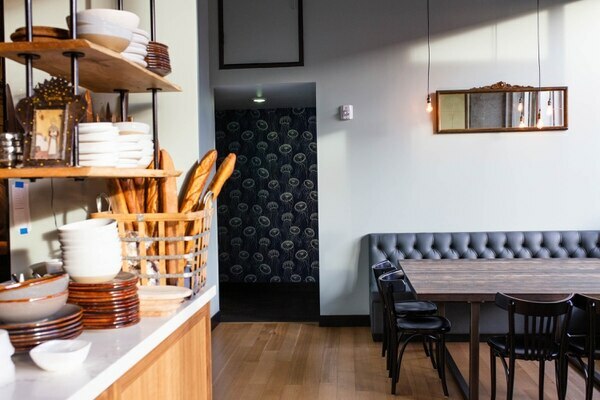 Presumably, the operators hope to offer something clever and distinctive, given that it's surrounded by a half-dozen restaurants of note within a six-block radius, including two nearby run by one of Portland's most acclaimed chefs. 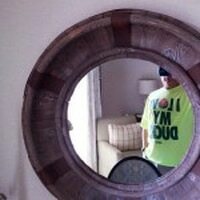 Unfortunately, only Gabe Rucker gets to be Gabe Rucker. 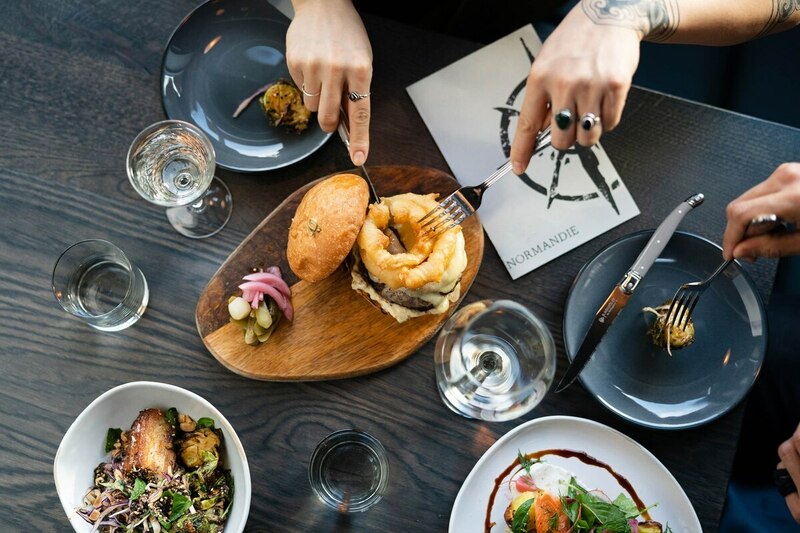 In the case of Normandie, and head chef Heather Kintler, there are simply too many ingredients in nearly every dish. 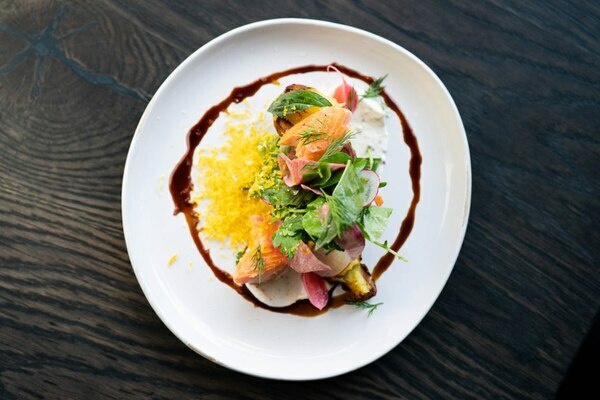 Likewise, the smoked and cured Arctic char ($13), in which the fish gets a flavorful cure and a portion goes on to receive a short cold smoke, would be wonderful with just the proffered horseradish crème fraîche and the grating of cured egg yolk. It did not benefit at all, however, from the addition of black vinegar caramel, pickled beets and yet another blanket of mixed herbs. And does the "charred Spanish octopus" entree ($21) really need rose harissa glaze, orange segments, olives, cured lime yogurt, radicchio and still more leaves and fronds on top? So it goes, up and down the food and even the bar menu, like a multicar pileup on a foggy freeway. 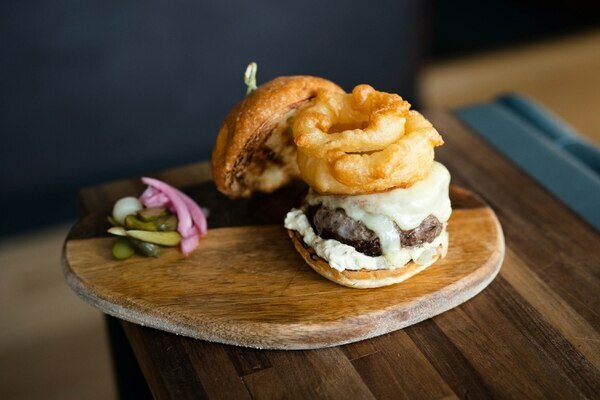 Brioche bun-haters will blanch at the burger ($14), which would be fine if the only toppings were Swiss cheese, deeply caramelized onions and, arguably, the mustard aioli. Adding a couple overbreaded, gummy onion rings was not a positive, nor was using brioche, which tends to fall apart when assaulted with wet ingredients. Better to 86 the rings and add a decent-sized pile of fries (preferably all hot) as part of the dish rather than as a $2 supplement. Even the drinks list sounds concocted via a random ingredient generator. A cocktail-loving friend referred to it as "pretty batshit," which distills my thoughts eloquently. A charitable bartending maven suggested all the esoteric ingredients make it challenging for less-experienced drinkers. But even a longtime teetotaler like me knows that a "classic" martini is gin with a whiff of vermouth. At Normandie, the base spirit is "rhum" with vermouth, Benedectine, lemon and cardamom ($11), and the list tends to get loonier from there. Normandie is a spot I wanted to like, given its connection to the late, lamented Veritable Quandary. But the operators would be well-advised to adapt Chanel's advice—before serving a plate, take a look at the dish, and take at least one ingredient off, if not two or three. EAT: Normandie, 1005 NE Ankeny St., 503-233-4129, normandiepdx.com. 4 pm-midnight nightly.